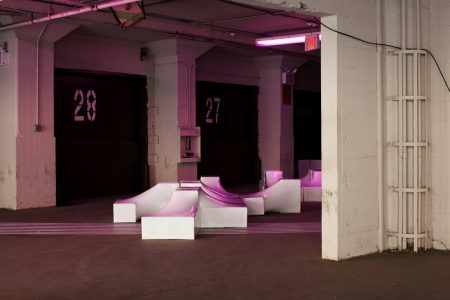 In the fall of 2012, Leong Leong was commissioned by Creative Time to design an environmental backdrop and temporary seating for their annual Summit. Inspired by the topic of “Confronting Inequality,” we conceived a modular landscape, based on the conceit of re-constructing the World’s seven continents, from uniquely designed banker’s boxes. On the first day of presentations, the continental banker’s boxes were stacked to form a backdrop for a range of speakers, including art-world luminaries, rural community organizers, and international activists. On the second day, the boxes were re-organized and clustered into discussion enclaves where speakers and participants engaged each other directly using the surface of the boxes to record their conversations.